Munich - The Bundesliga once again threw up it's fair share of gut-wrenching and euphoric moments in equal measure on a weekend which boasted four missed penalties and a much-talked about wonder goal. Hannover 96 0-4 FC Bayern MünchenTayfun Korkut (Hannover): We played really well during the opening 25 minutes, but unfortunately for us we were also up against a team with amazing quality. Against one of the best sides in the world, you can't just execute your gameplan for short periods of the game; that's not enough. FC Bayern are the type of side that are completely ruthless when it comes to taking their chances. Pep Guardiola (FC Bayern): We're very happy. We've taken the chance to extend our lead at the top of the table. We had a few problems at the beginning but after scoring the opener it became a lot easier for us and we played with a greater sense of freedom. Tom Starke deserved a start today. It’s difficult for him when he's playing second fiddle to the best in the world [Manuel Neuer], but I was delighted to give him a chance and I was pleased with his performance. Eintracht Frankfurt 0-0 SV Werder BremenArmin Veh (Frankfurt): I'm not at all happy with just a point. Bremen's sending off didn't help us in the slightest because they were so organised and we were wary of being caught on the counter. You have to win games like this when you're at home, especially when you consider we had 21 shots to their three. It also didn’t help that we played on Thursday either. Robin Dutt: This small moral victory can help us going forward. We don't know how much the point will help us in the long run, but it will definitely benefit us in some way. Looking at the number of goals we’ve conceded, to keep a clean sheet here and defend for over an hour with ten men is pretty good. VfL Wolfsburg 3-1 Bayer 04 LeverkusenDieter Hecking (Wolfsburg): The most important thing is that we're collecting points with every passing week. That will ultimately be the deciding factor as to where we finish this season. I don't think we need to be more attacking. The team are doing a great job. That's going to keep the pressure on the teams above us. However, we saw today how tight games can be, especially when we aren't playing well. The top four teams might be a little bit better than us, but we're capable of causing an upset. Kevin De Bruyne was excellent today, both going forward and in tracking back, and Ricardo Rodriguez has nothing to worry about. He'd be shocked if I took him off penalty duty. Sami Hyypiä (Leverkusen): The way we played was okay, but Wolfsburg punished our lack of concentration in ruthlessly. Scoring was really difficult for us today and at the other end we conceded simple goals. We showed great character in the first half, but then they scored and it became all the more difficult. For their second, they reacted quickly and we just stood and watched. We've got to do things a little differently now. Fortunately, we've got a week to recharge our batteries. 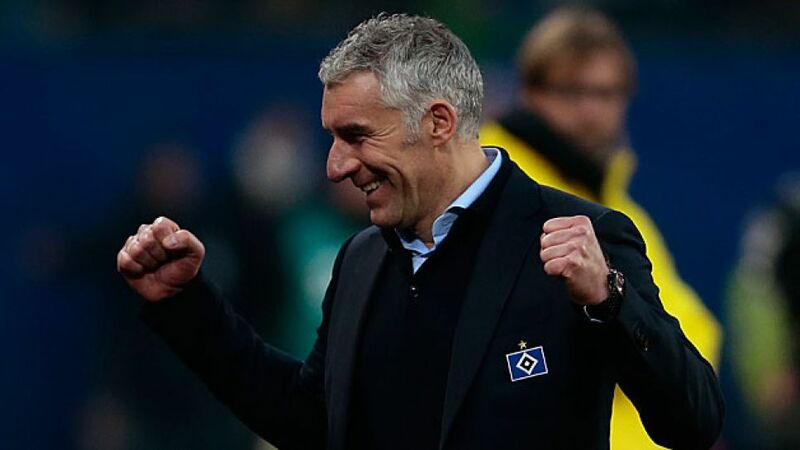 Hamburger SV 3-0 Borussia DortmundMirko Slomka (Hamburg): In truth, we didn't deserve to win the match by such a convincing margin. We were fantastic defensively for long periods, though and the team can be very proud of picking up three points. Today was just one of 13 games left to play and we won’t stop working hard to ensure we remain in the Bundesliga. Jürgen Klopp (Dortmund): HSV fully deserved to win today. We did ourselves absolutely no favours at all. They played well in the first 45 minutes, and at half-time we were determined to come out and change things. That didn't go to plan, though, and their goal was reward for three very painful months. This was a very average performance from our perspective. Borussia Mönchengladbach 2-2 1899 HoffenheimLucien Favre (Gladbach): We started the game really well and we wanted a third goal because we knew how dangerous Hoffenheim can be. The goal we conceded to make it 2-1 was unnecessary. We didn't have anywhere near enough possession. That's a big disappointment. This is a very difficult time for us. We've got to remain realistic and try to defend and attack in equal measure to start picking up points again. Markus Gisdol (Hoffenheim): I had a feeling from the very beginning of the match that we’d start well, but y the time I sat down we were already 2-0 down. We then tried to set ourselves up from scratch during the half-time break to try and put them under more pressure. We decided to switch to having two strikers up front and shifted to a diamond midfield formation. We deserved to take a point from the match. Jens Keller (Schalke): We can live with just taking a point from this match. We made life very difficult for ourselves, especially in the first half, which is why we've got to be pleased with picking up a point. You can't expect us to thrash everybody here. Mainz were good opponents and that's why the result's fine. We're now looking forward to Real Madrid, and we're not going into that game just to exchange our shirts. Thomas Tuchel (Mainz): We were very brave and recent results had given us a lot of confidence. It's very special to get a point from a Champions League team who had won four games in a row this year. I'm very happy.